Real Madrid suffered yet another loss at the hands of their fiercest rivals, Barcelona, this time in La Liga. 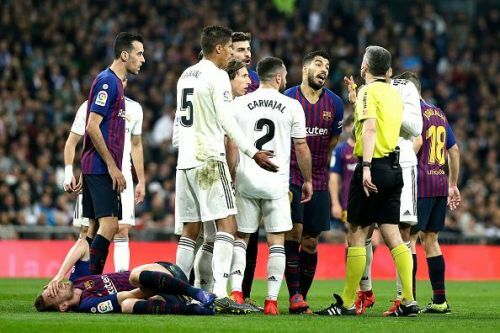 Real Madrid has failed to register a single win out of the four El Clasico played this season. FC Barcelona sit pretty comfortably at the top of the league and are 10 points clear of second-placed Atletico Madrid. Real Madrid are certainly out of the La Liga title race and would now turn their attention to Champions League, the competition they have won for the past three years. Solari made two changes from their 3-0 loss in the midweek, bringing Gareth Bale and Thibaut Courtois for Lucas Vasquez and Keylor Navas. Valverde brought Arthur in the midfield and replaced Nelson Semedo with Sergi Roberto to right back. Real Madrid were the superior side in the opening minutes of the game, while the visitors struggled. It was a high-intensity game in which the visitors found their footing after 15 minutes. Barcelona scored the only goal of the game in the 26th minute through Ivan Rakitic who was assisted superbly by Sergi Roberto. The Croat looped the ball over Thibaut Courtois who could only watch the beauty of the finish. Madrid tried everything they could but failed to find the equalizer. It is quite evident that the accuracy in the final third has been the prominent reason for Madrid not able to win the high-intensity games. Thibaut Courtois - 6: He saved four out of three shots on target which is quite good given the quality of opponents. Possibly, could have done better to save the Rakitic's goal that gave Barcelona the win. Dani Carvajal - 5.5: Performed very well throughout the game. He failed to feed the accurate crosses in the box. Rafael Varane - 6: Was certainly better than his partner in the centre. Made quick runs back in the defence when Madrid lost the possession. Sergio Ramos - 4.5: Spaniard was firm throughout the game and kept the duo of Messi-Suarez at bay. Was responsible for the only goal as he failed to track the Croatians run who chipped the ball over Courtois. Sergio Reguilon - 7: The youngster was the best performer for the Spanish giants. Had 4 tackles in the game and put in some amazing crosses from the left flank. Casemiro - 5.5: Looked exhausted and was nowhere near his best. Slowed the game while Madrid were in possession. Luka Modric - 5.5: Failed to make his mark on the pitch. Misplaced a number of passes. Toni Kroos - 5.5: German midfielder didn't play the way he is capable of. Made some good passes with his vision but looked clueless at times. Gareth Bale - 3: Was the worst player on the pitch. Only a single shot in his 60 minutes, a free kick, which failed to hit the target and blasted the ball over the net. Karim Benzema - 4: The centre back duo of Pique and Lenglet kept hold of the Frenchmen and didn't give any opportunity to register his name on the scoresheet. Had only shot on target in the game. Vinicius Junior - 6: Formed a formidable pair with Reguilon on the left. He could have easily scored the equalizer had the youngster been clinical in the front of the goal. Fede Valverde - 5: Made one key pass in 35 minutes on the pitch. Was successful in eliminating the threat of Messi, who looked dangerous in the second half. Marco Asensio - 5.5: Worked hard to get the goal at the very moment he was brought on the pitch for Gareth Bale. Isco - 5.5: Spanish magician got immediately involved and combined well with his teammates. He is worthy of making the starting XI in the next games.